1. Wash palak, drain water and chop coarsely. 2. Boil spinach. When cooked drain throughly and grind. 3. Add besan and rice flour, green chillies, redchilli powder&salt. 4.Mix well in cooked spinach and make small balls of the mixture. 5.No water to be added at all since the batter can be mixed in the juice of palak itself. 6.Make small flat vadas out of this dough and fry them in oil on medium heat. 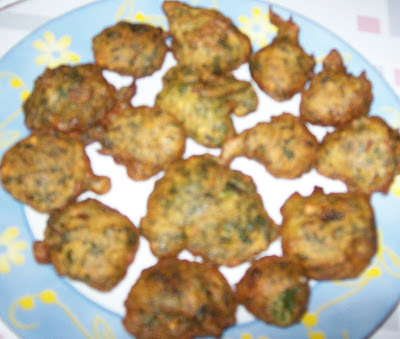 7.Till the pakodas are of light brown colour. this is different method and will try it....I used to just chop spinach and onions along with the besan with little bit of water...this method sounds interesting...looks perfect at teatime.. Thank you suma.. yes itis delicious and perfect tea time snack..